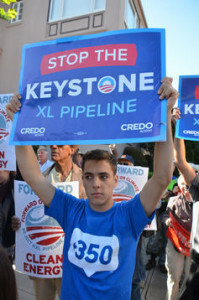 At The Conversation: "The activists' playbook behind Obama’s Keystone rejection" - Luis E. Hestres, Ph.D.
(Occasionally) deep thoughts on communication, technology and social change. According to my research into climate change activism, 350.org – an advocacy organization co-founded by environmental author Bill McKibben – and its allies employed a number of communication tactics to achieve what is one of the biggest symbolic victories for the US climate movement to date. Specifically, climate activists embraced the following strategies to scuttle the pipeline: shifting the final decision from the State Department to the White House; effectively counter-framing pro-pipeline arguments; and successfully combining digital organizing with offline actions. The Conversation bills itself as “an independent source of news and views, sourced from the academic and research community and delivered direct to the public.” Read my whole piece at The Conversation and let me know what you think! © 2019 Luis E. Hestres, Ph.D.. All rights reserved.